Featured Photograph:  A demonstrator catches fire, after the gas tank of a police motorbike exploded, during clashes in a protest against Venezuelan President Nicolas Maduro, in Caracas on May 3. Venezuela's angry opposition rallied vowing huge street protests against President Nicolas Maduro's plan to rewrite the constitution and accusing him of dodging elections to cling to power despite deadly unrest. Over this past weekend, hungry and angry Venezuelan protesters looted a food collection charity installation as well as a supermarket in Venezuela’s state of Merida and allegedly even slaughtered cattle — sometimes with only their hands — in a local field as the violence blamed on food shortages spread throughout the once prosperous and oil-rich capitalist country. When Venezuelans decided to vote for a friend and comrade to Cuba’s Fidel Castro, Hugo Chavez, little did they know it was the beginning of the dire straits and the end of economic freedom as Chavez began to commandeer private sector businesses and services. He introduced Karl Marx to the people of Venezuela. 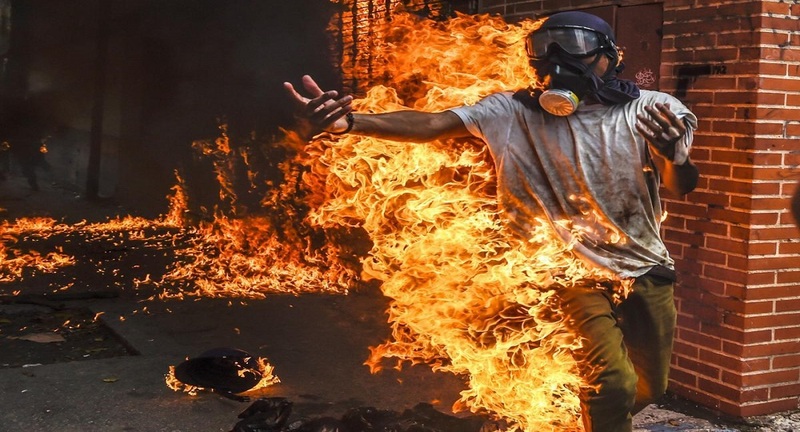 After years of unabated recession and the world’s highest inflation rate, the corrupt government has plunged millions of Venezuelans into poverty, and Chavez’s successor President Nicolas Maduro’s authoritarian socialist regime faces mounting unrest. Navy Adm. Craig S. Faller, commander of U.S. Southern Command, testifying before the Senate Armed Services Committee regarding the Defense Authorization Request for fiscal year 2020 and the Future Years Defense Program, mentioned the deterioration of the Venezuelan nation. 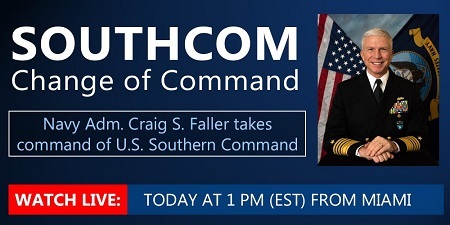 Adm. Faller’s Southcom area of responsibility includes Latin America south of Mexico, the waters adjacent to Central and South America, and the Caribbean Sea. About 5 million people have fled Venezuela since 2015, creating crises in Colombia, Brazil, Ecuador and Peru. External state actors are expanding their influence in the Western Hemisphere, Faller said. Russia in particular, “enables actions in Venezuela, Nicaragua and Cuba that threaten hemispheric security and prosperity,” he said. As a leading state sponsor of terrorism, Iran’s activities in this hemisphere also are concerning, Faller noted. “Southcom is supporting diplomatic efforts and we are prepared to protect U.S. personnel and diplomatic facilities if necessary” in Venezuela, he said. Other ongoing concerns in the region include criminal organizations, narco-traffickers, illegal immigration, violent extremists, corruption and weak governments. 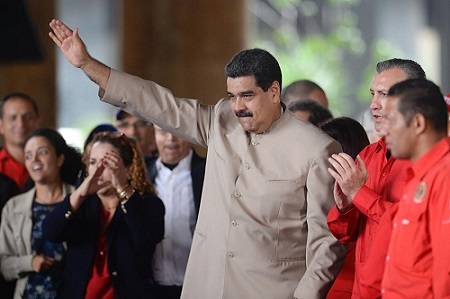 Although not mentioned specifically, Iran’s involvement in Venezuela opened the door to terrorist organizations to station fighters in that Latin American region. Iran’s proxy military-arm, Hezbollah has been involved in South America since the Bush administration. The U.S. is building strong partnerships with Southcom nations, Faller said, noting that these partnerships are not just military to military, but are also diplomatic partnerships by the State Department and by other organizations, such as the U.S. Agency for International Development and the departments of Justice and Homeland Security.